For the last 3 years we have been working on a research project on UDP services who could be and are being abused in relation to DDoS Attacks. The original idea was to attempt to identify why a large part of DDoS attacks were originating from Russia and China, could this be due to the amount of services in the different countries or ? The answer to this was not conclusive as the services abused had a high amount in the two countries there were no direct evidence onto why. A guess could be that take-downs of vulnerable services in these countries, were not seen as much but again nothing conclusive. Around 12.000.000+ services is public on the internet and could potentially be abused in DDoS attacks. The research covered 20 different UDP services, with 21 different attacks scenarios. During this research as often happens when you go down the rabbit hole you end up in another place and the research turned from defensive to offensive. By using the large dataset collected in this case only on UDP the attack scenario of “MaxPain” came to life. The thought behind this is that the closer to the target and attacker can come. When applying the attack analysis of MaxPain you start searching as close to the victim for and work you way out. This can have the effect that instead of having to reach the DDoS size of 1-2 Tbit/s you just need to reach line speed on the internet connection. “The Constrained Application Protocol (CoAP) is a specialized web transfer protocol for use with constrained nodes and constrained networks in the Internet of Things. What was especially “interesting” was that this protocol was designed around 2014 and still not found a way to avoid from being abused. The service was not really being used when the research project started, however around between november 2017 and december 2018 it jumped from 6500 instances to 26.000 and last month it was close to 600.000 just in China and still raising. Now this research project has come to an end and we are happy to announce that Censys has allowed eCrimeLabs to share the raw scanning dataset on the scans.io project page - https://scans.io/study/ecrimelabs-amplifiers. The dataset consist of 3 large *.tar files, that again contains a lot of bz2 compressed json files. If you like to work with PCAP’s instead a JSON file, the json2pcap conversion tool is located on Github. 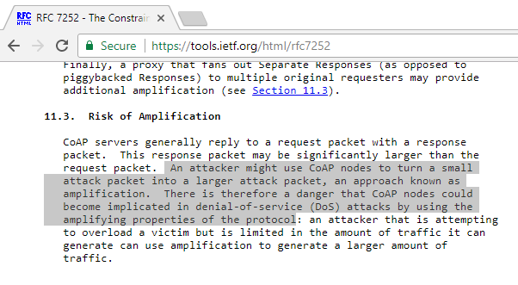 This can be used as “simulated” attacks, in your security products. DIGITAL HYGIENE – Put demands to your ISP/Hosting provider, If you are an ISP/Hosting provider put demands to your customers. On the 7. of June 2018 Dennis Rand presented on the RVASec conference in Richmond, Virginia on the topic of how we in the future will see attacks that are not easily or even possible to mitigate. The need to do digital hygiene if we want to protect our networks. The videos from the conference has now been released. eCrimeLabs is proud to announce Dennis Rand will be attending as speaker at RVAsec 2018 in Richmond Virginia. "RVAsec is the first Richmond, Virginia, security convention to bring top speakers to the mid-atlantic region. The conference will be held on Thursday, June 7th and Friday June 8th 2018 at the Commonwealth Ballroom at VCU’s University Commons." The research presented started originally back in 2016 with analysis of DDoS attacks. As the research and analysis of data evolved, I discovered that there is a large gap in the Anti-DDoS defenses that are existing today allowing attackers with a minimal of effort and some data mining to bypass the enterprise and ISP based DDoS solutions out there. Also during the research I was looking through alternate UDP service that could in the future pose a problem and here came upon an IoT protocol, introducing the same possibilities as services designed over 20 years ago. The problem exists in the still large and growing amount of vulnerable services exposed to the internet. The numbers from April 2018 was close to 19.000.000 IP's that has a potential of being abused.